We are delighted that Scarlet Vintage & Retro has won an award from Hospice UK! Scarlet Vintage and Retro in Harlow’s town centre won the award for its creative layout and vintage wares, in addition to its eye-catching window displays – designed by talented St Clare shop staff and volunteers. The displays, which have become a popular talking point for customers and shoppers, feature creatively displayed items from the shop’s extensive wares of vintage and retro clothing accessories, collectables and homeware. One such display received a special mention from national charity and awarding body, Hospice UK: the ‘Mary Poppins window,’ which featured the familiar, fictional nanny flying over the London skyline, umbrella in hand and her famous carpetbag with its goods tumbling out. Another memorable display included an ‘Oscar’ themed window that featured vintage postcards of legendary starlets. However, there is much more to this local treasure trove than its show-stopping window displays alone. After celebrating its launch event in October 2018, this quirky, hospice retail outlet has taken five short months to put itself on the map as a strong community-hotspot within the local area. 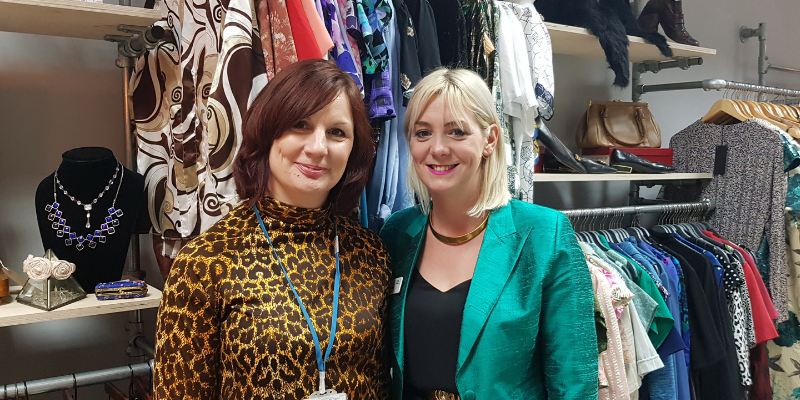 After establishing key relationships with other community organisations throughout Harlow – such as Rainbow Services, Harlow College, Burnt Mill School and The Square – Scarlet Vintage & Retro is fast-becoming one of the Hospice’s most successful retail outlets to date.